Bakersfield, CA – The SPEARS Southwest Tour Series is proud to announce that Coleman Powersports is now part of the series’ family of sponsors for the 2018 season. The SPEARS Southwest Tour Series is known for attracting new and exciting sponsors to the racing world, and Coleman Powersports is all about excitement. Coleman Powersports, headquartered in Tempe, AZ, carries a full line of ATV’s, mini bikes, go carts, UTV’s, outboard motors, dirt bikes, generators and their most recent addition, the Drift Trike. Imagine your childhood “Big Wheel” on steroids and you can get a rough idea what this exciting product is all about. The Drift Trike will be in action at the June 9th Irwindale Speedway event and the October 27th race at Kern County Raceway. Not only will Coleman Powersports be the presenting sponsor of both events, they will also conduct a Drift Trike exhibition on track as part of the night’s festivities. Coleman Powersports is no stranger to motorsports, as Rich Godfrey’s company, Yerf-Dog, was part of Dave Reed Racing and Craig Raudman’s NASCAR Southwest Tour Series championship season in 2001. Godfrey’s new company, Coleman Powersports, will return as an associate sponsor of the #2 car at both the Irwindale Speedway and Kern County Raceway SPEARS Southwest Tour Series events. “We here at Coleman Powersports are all really looking forward to be back in racing again after many years with Dave and Craig and winning the championship in 2001. The SPEARS Southwest Tour Series is a great venue to market our products. The demographics are right in line with our clientele base.” stated Coleman Powersports’ Neil Godfrey. Coleman Powersports will also have their full line of products on display at both races, so race fans can get an up close look at what Coleman Powersports offers. As part of their partnership, Coleman Powersports will be the Hard Charger sponsor for each race in the 2018 season. 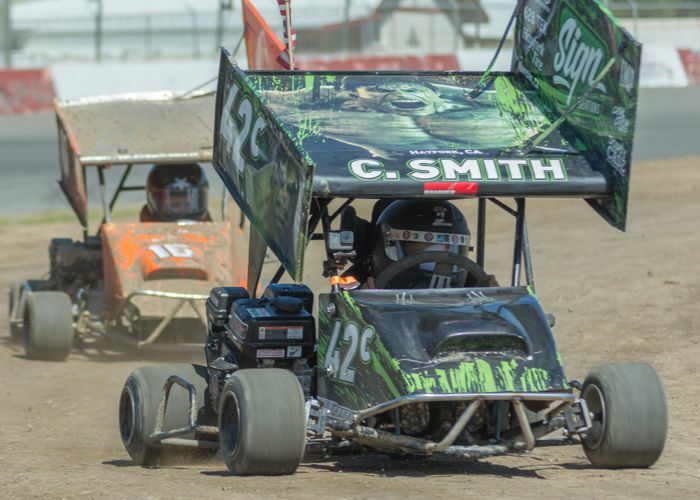 The driver that advances the most spots from their starting position will earn an opportunity to win a Coleman Powersports Mini Bike (196cc/6.5hp centrifugal clutch bike) at the 2018 SPEARS Southwest Tour Series Awards Banquet. If you can’t make it out to the racetrack to see these products up close or you can’t wait until June 9th, you can follow them on Instagram at colemanpowersports_usa, on Facebook at colemanpowersportusa or on their website colemanpowersportsusa.com. About Coleman Powersports: Coleman Powersports manufactures gas-powered, recreational vehicles that are fun for the entire family including minibikes, go karts, drift trikes, outboard motors, UTVs and ATVs. About SPEARS MANUFACTURING: Spears Manufacturing is a world leader in plastic pipe products. SPEARS’ maintains over one million square feet of manufacturing facilities in four states and nine distribution centers across the USA for worldwide distribution. For more information go to http://www.spearsmfg.com. About the SPEARS Southwest Tour Series: Celebrating its eighteenth season in 2018, the SPEARS Southwest Tour Series is a regional stock car series competing on paved ovals in the southwestern portion of the U.S. http://www.srlsouthwesttour.com. “The SPEARS Southwest Tour Series…Where the Champions Race”. Eureka, CA (April 26, 2018) – With a high percentage rain in the forecast both Friday and Saturday, Redwood Acres Raceway officials have decided to delay the season-opening event. Thankfully fans and racers will only have a week to wait as Saturday May 5th will now be the track’s first race of 2018. As was scheduled, Root 101 Nursery will be the lead sponsor for the night’s action. Roadrunners, Legends, bombers and mini stocks will be in competition as well as the Super 6 Challenge Series late models for a 50-lap race. The event will also feature Redwood Acres Raceway’s newest division, the bandoleros which are small cars driven by youngsters. This Saturday night the NASCAR Late Models return to the high banks of Kern County Raceway. The top NASCAR division at KCRP will compete in twin main events for the first time in 2018. Along with the headlining Late Models, the NASCAR Spec Mods are back for the second time in as many weeks. Completing the show are the INEX Legends who are also racing twin main events, The INEX Bandoleros, and “The Future Stars of Racing” The Mini Dwarfs. A stout field of racers is expected in the NASCAR Late Models, Including defending track and California State Champ, Trevor Huddleston; Current point’s leader and grandson of racing legend Parnelli Jones, Jagger Jones; plus, off-road racing champion and star of the new Discovery Channel Show “Twin Turbos” Brad DeBerti. Local favorites Brandon Weaver, who sits second in points; Paul Ebersbacher, who had a career best finish of third in the last late model race; Tom Gibson in the #7 car who sits seventh in points, and Tanner Wattenbarger, the young gun competing in both the Late Models at KCRP and The SPEARS Southwest Tour are poised to take on all challengers! Spectator gates for Saturday’s NASCAR Racing and Family Fun will open at 4:30 pm, Racing begins at 6:00 pm. Adult tickets start at ten dollars and are available at www.kernraceway.com or the box office on race day. Kern County Raceway is proud to partner with Budweiser, Bulwark FR, Coors Light, Jim Burke Ford, and Whelen Engineering. Eureka, CA (April 25, 2018) – Outlaw kart racing returned to the Redwood Acres Fairground for the first time this past weekend, April 14th. It’s the third time that the outlaws have raced at the fairgrounds but the first under of the Humboldt Outlaw Kart banner. The same divisions that have been racing on the 1/10th-mile dirt oval returned; beginner box stocks, box stocks, old fart karts, 125/250cc and 500cc/open karts. The opening day’s races were presented by Eureka Payments. The heat race in the Champagne Attorney Service beginner box stocks was Jack Myers. Corbin Green jumped to the led on the restart before spinning and surrendering the lead to Chayce Smith. The restart saw Smith pull out to a substantial lead while Myers, Green and Aaliyah Hughs battled for the second position. There were two more yellows in the race which bunched the field. Each time, Smith was able to pull away from the field. At the finish it was Smith taking the victory. The Williamson Financial box stock heat race was won by Derek Kessler. T.J. Sorrels took the lead at the start of the main event which saw several cautions. The first saw Janice Walters lose power on the front stretch. The second came when Madison Donovan slid off the track. The restart featured an exciting battle between Sorrels and Dryver Dothage. At one point, Dothage got too high in turn four and nearly slid off the track. The final handful of laps proved to be stirring. While racing for the lead, Sorrels spun with Dothage going off the track to avoid. Keegan Bounds was now the leader but his kart had issues. Sorrels regained the lead. Dothage’s final attempt at the victory sadly came up short as he went off track. Sorrels was able to take the checkered flag. Jordan Miclette in the Fortuna Wheel & Brake old fart kart heat race. The main event proved to be a different story as Nick Ford jumped into the lead at the start. Ford would lead wire-to-wire to claim the victory over Miclette. The Wes Green Landscaping 125/250cc kart heat race winner proved to be Landen Green. The main event proved to be no different for Green. He was able to quickly take the lead at the green flag and even with problems with his kart, he was still able to maintain the lead. Behind him, MKinzy Uselton and Kloey Smith had a spirited battle for the second position. In the end, Smith was able to gain the upper hand for the second position. The finish saw Green win over Smith and Uselton. Cliff Myer was victorious in the NorCal Automotive 500cc/open kart division. Myer led the open two laps of the main event before Chelsea Champagne moved to the lead. Champagne had the advantage all race long in spite of two caution flags due to spins by Myer. While taking the white flag on the last lap, Champagne’s kart lost power. At the same time, Myer spun for the third time in the race. With Champagne unable to continue in the race, Myer was declared the winner. WENATCHEE, WA (April 23, 2018) A stellar field of super late model cars and drivers is set for the 4th Annual Leonard Evans 150 scheduled for April 28th at Wenatchee Valley Super Oval (WVSO) for the Northwest Super Late Model Series, Inc., (NWSLMS) season opener. A mix of rookie and veteran competitors will start the season off with a bang. 2017 Season Champion Brittney Zamora hopes to repeat her last win at WVSO, the Neal Newberry 150 back in September, which capped off a great sophomore season and earning her the honor of being the first female west coast touring division champion, as well as the youngest driver to win the series title. Zamora has expanded her schedule for 2018 to include a full season at Evergreen Speedway. 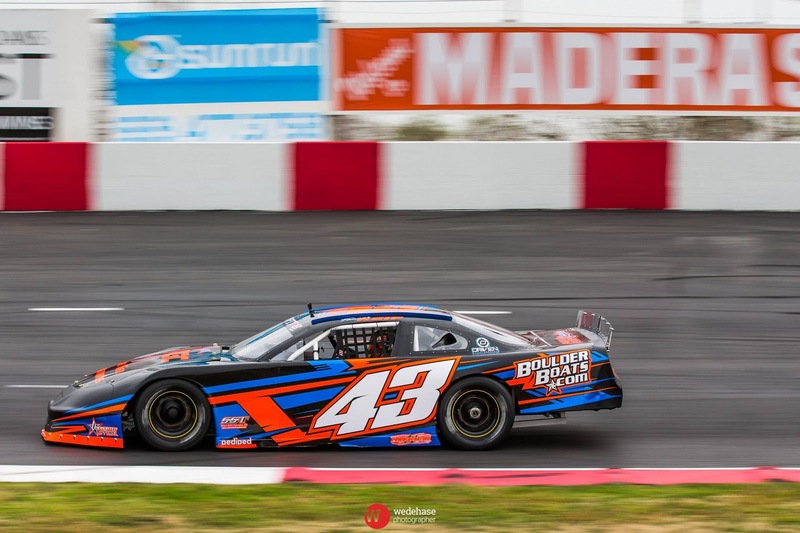 Zamora picked up the CW11 Supergirl sponsorship, as well as being selected as one of seven participants in the Alan Kulwicki Driver Development Program in the off season. She’s definitely making her mark on the northwest circuit. Runner-up Jan Evans, fresh off his Jefferson Pitts Rookie of the Year season in 2017, will be back for the Leonard Evans 150, named after his late grandfather. 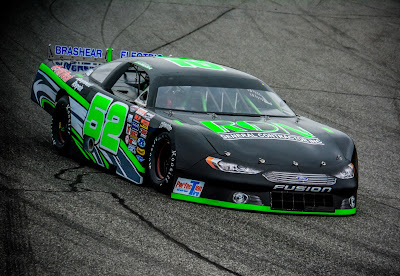 Sixteen-year-old Evans, debuting a new car number, had an outstanding rookie season, bringing home second in the overall points standings and a season high second place finish. Mitch Kleyn, the only driver to compete in every race in the series, has finished second or third in the championship standings in the series first four years of existence. Kleyn scored his first Super Late Model event last season at South Sound Speedway. Kleyn and the Wild 1 racing team are poised and looking for the big prize at the end this season. The 2017 Speed51.com Most Popular Driver, Brooke Schimmel will be back in action looking for a title in 2018. The 17-year old driver was victorious at Meridian Speedway, as well as taking the series win at Rocky Mountain Raceway in 2017. Schimmel ran as a development driver for Lee Faulk Motorsports during the 2017 season, competing mostly in North Carolina, but plans to focus her efforts closer to home this year. In addition to many regular NWSLMS drivers, a few new faces will be competing during the 2018 season. Trenton Moriarity, 25-year-old 2017 NASCAR Whelen All American Series champion will make his NWSLMS debut. Moriarity, who will be running for the Jefferson Pitts Rookie of the Year status in 2018, will also be in the hunt for his first NWSLMS win. Alex Lessor, a multi-time Montana Raceway Park Champion, will make the long haul to Washington in a bid for his first series win. While Lessor hasn’t had the best of luck in his previous NWSLMS attempts, he’s looking for the break to turn his luck around. No stranger to winning super late model events, Tayler Riddle, a previous Leonard Evans 150 winner, will be ready to back it up. 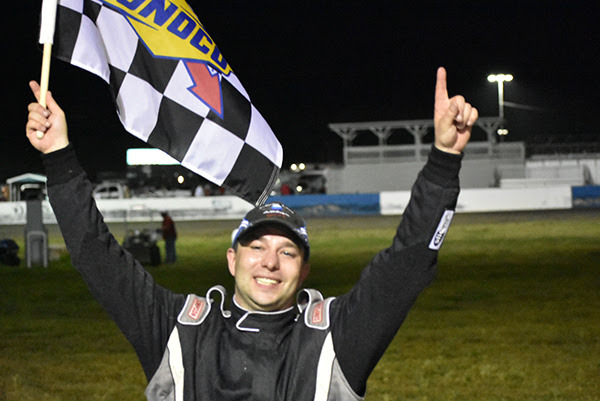 Riddle, who could be a challenger for the series championship has previously won 4 NWSLMS features, as well as some of the region’s most prestigious and richest events, including the 2015 Chilly Willy and the 2016 Summer Showdown. These are highlights from just a few of the drivers, from all over the northwest, including Canada that will be on hand for this event to kick off the 2018 season. MADERA, CALIFORNIA (April 23, 2018) – RPM Mortgage Pro Late Models and 51FIFTY Energy Drink Jr. Late Models continue their strong start to 2018 Saturday at Madera Speedway, for the third round of the MAVTV-televised series. The Pro Late Models will battle for 80 laps while the Jr. Late Models will compete for 70 laps around the fastest one-third mile the west. The Mini Cup vs. Bandolero series, Toyota Sedans, and Hobby Stocks make up the rest of the night’s racing entertainment. Matt Erickson has already scored over $7,000 in prize money across the first two RPM Mortgage Pro Late Model Series races of the year with a sweep of both races. The dominant start to the year has yielded a 25 point lead over 2017 Rookie of the Year Austin Herzog. Herzog, the six-time Jr. Late Model winner, gave Erickson his best challenge yet in round #2. The race was marked by exciting back-and-forth battling before Herzog spun with six laps remaining to end his chances for a win. Multi-time track champion Rick Thompson picked up on a third place finish on April 8th to move to third in the points. Thompson is just one point ahead of Garland Tyler and Glen Cook who are tied for fourth. A new sheriff is in town in the 51FIFTY Energy Drink Jr. Late Model Series as “Rolling the Dice” Tanner Reif of Las Vegas leads the championship. The third season for the series for drivers ages 10-16 years old has been perhaps the most competitive yet. Defending champion Jesse Love scored his sixth career series win on April 8th and matches that with a third place finish opening night to run second in the standings. Bakersfield’s Kabe McClenny has second and fourth place finishes for third in the championship. Opening night winner Dylan Zampa of Napa is fourth with Mentone’s Austin Edwards rounding out the top-five. Mini Cup vs. Bandolero was originally billed as a north versus south, with most of the Mini Cup racers coming from the northern part of the family while the Bandoleros compete primarily in Bakersfield, Irwindale, and Las Vegas. But Bakersfield drivers Kale McClenny and Kercie Jung have each swept their respective divisions. Jung, 12, is the 2017 Kern County Raceway Park Bando champion while McClenny is in his second season of Mini Cups. Both aim to move into the Jr. Late Model division soon. The 20 lap races are televised for coverage on MAVTV during the Jr. Late Model broadcasts. Toyota Sedans have been the busiest division at Madera as Saturday’s event is their fourth of the year. 2016 champion Jillaun Holden has two wins to lead the championship while Jason Lawton won the last main event. Thomas Magray is second in the championship followed by 2017 champion Mike Marley. 16 different drivers have started a race so far across the Sedans and F4s that run together. Hobby Stocks put on a fine season opener that saw Howard Holden take a come-from-behind win over Chuck Dozhier. The battling will continue in a 30 lap race this weekend. This weekend’s activities begin with an open practice on Friday night from 5 p.m. – 8 p.m. On Saturday, pit gates open at 10:30 a.m. with practices beginning at noon. Qualifying follows at 2 p.m. with the first heat races and main events beginning at 4:15 p.m. Opening ceremonies are slated for 5:30 p.m.
Tickets are value priced at just $15 for adults, $13 for seniors and military, $7 for youth ages 6-12, and kids five and under are free! SACRAMENTO, CALIFORNIA (April 23, 2018) – The Pacific Challenge Series presented by PenneyLawyers.com will now feature five different race tracks across its eight race Super Late Model touring series, as Ukiah Speedway will host the series on May 19th. The race has been moved from All American Speedway in Roseville, CA, as the track continues negotiations for a new promoter. Currently scheduled races at Roseville for September 8 and October 13 remain on the calendar tentative to the one-third mile completing their agreement. Ukiah Speedway is the tightest quarters racing of the year on the high-banked quarter-mile oval. Randy Hedrick of Reno, NV won a thriller to take last July’s round and will be among drivers looking forward to the series’ return. Two-time PCS champion Mike Beeler of Modesto has been a dominant force at the track, scoring four top-twos in the last two years. His victory at Ukiah in 2016 saw him sweep around the outside of JR Courage in an exciting and decisive move. 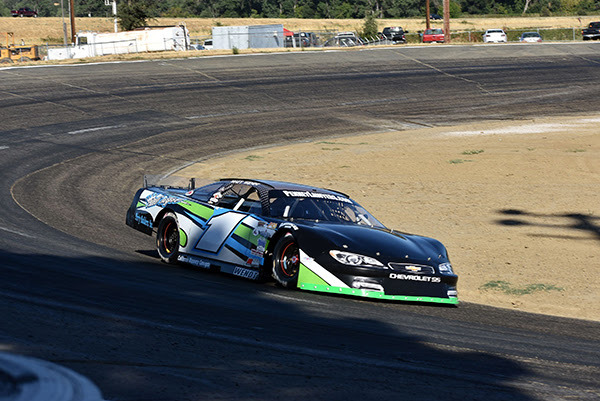 The PCS runs once monthly this season, with Shasta Speedway following Ukiah on June 23rd. Stockton and Madera are also hosting races in 2018. The Pacific Challenge Series is presented by: Penney Racing Supply, Penney & Associates, American Racer Tires, Radio Law Talk, Compact-It, Northwest Compactors, Naake Suspension, Sunoco Fuels, Five Star Bodies, BrakeOMeter, Lefthander Chassis, ARP Bodies, Joes Racing Products, Bassett Wheels, Frank's Radio, WrapStar Pro, and Blakesley Sports Media. All PCS Super Late Models race ABC Bodies or Muscle Car bodies on American Racer Tires with Sunoco Racing Fuel. BAKERSFIELD, CALIFORNIA (April 23, 2018) – After a highly successful inaugural indoor racing campaign, Bakersfield Karting Experience has set a slate of ten races for the “Indoor Summer Series”. Races will be staged on Friday nights on the 1/10th mile dirt oval for a variety of Outlaw Kart, flat Kart, and Mini Dwarf divisions. Nearly a dozen divisions will compete for points in the series. The 2017-18 Winter Series included separate nights of competition for Outlaw Karts, Flat Karts, and Mini Dwarfs. The Outlaw Kart nights saw a season-wide average of 20 karts per event including the busy Indoor Kart Nationals in January. Open Outlaw Karts proved to be a regional draw with many racers crossing over from other valley racing divisions to compete. The all-star nature of the driver line-up is expected to continue into the summer with few conflicting dates with area race tracks. For the 2018 Summer Series, Open Outlaw Karts will headline all ten nights of racing. Half of the shows will be designated “A” shows with stock and open flat karts and Jr. & Sr. Mini Dwarfs competing, while the “B” shows will be dedicated to Outlaw Kart classes such as Open 250 Intermediate, Box Stock, and Beginner Box Stock. Racing begins April 27th with the first A show while May 25th will be the first B show. The complete schedule is listed at the end of this press release. Bakersfield Karting Experience is a state of the art, complete entertainment venue. RC car racing, oval dirt kart racing, golf simulator, arcade games, and food and drink specials. BKE is open to the public 6 days a week with karts available for rent for a single race or for group outings. It is the only indoor public rental kart dirt oval in the world. Birthday parties and private room rentals round out the extensive options for a night out or for a great get together. 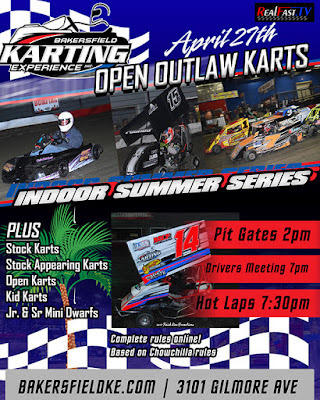 B- Open Outlaw Karts, Intermediate Karts, Beg Box Stock Kart, Box Stock Karts. ANDERSON, CALIFORNIA (April 21, 2018) – Jason Romero won his sixth career Pacific Challenge Series presented by PenneyLawyers.com feature, and first outside of All American Speedway, by taking Saturday’s 75 lap feature at Shasta Speedway. Romero opened up the night of Super Late Model racing on the 3/8ths mile by setting a new track record before the decisive victory. Romero’s lap of 15.428 in Sunoco Fuels qualifying lowered the mark previously set by two-time series champion Jeremy Doss of Upperlake, CA. Romero’s fast time placed him three tenths ahead of the rest of the 14 car pack. The gap narrowed when the drivers competed in the American Racer Tire Dash. The eight lap contest’s lineup is set by a redraw, which allowed 2015 champion & 2017 series runner-up John Moore to steer his Camaro to victory ahead of 2006 Westcar Late Model Series champion Shannon Mansch. Moore’s dash win gave him the pole for the main event, and he took the lead from Mansch at the start. He brought third-starting Romero with him. Several laps later, both Matt Scott and Cole Moore dove inside Mansch as well shuffling her back to fifth. The top-four broke into two pairs of battles until Scott and Cole Moore came together in turn one with Scott spinning his #35 car. John Dalerio and Matt Wendt were among those who had to scramble to avoid the spin. Both Scott and Moore had to pit for repairs. Romero passed John Moore on the outside to take the lead on the restart. The caution flew on lap 11 when debutant Jarrett Gilmer slowed with mechanical problems. Romero picked the inside for the restart which allowed John Moore to lead the 12th lap by a nose. Romero took the lead back the following lap. Willows’ Dane Nissen spun in turn four for the next caution on lap 21 with Scott heading to the pits briefly for more repairs during that caution. Nissen also pitted and retired from the race. Romero and John Moore both spun into turn one when the race restarted, with Tracy Bolin among those who suffered damage in the incident. Mansch assumed the top spot with Romero and Moore restarting at the back of the field. Cole Moore used the incident and the restart to advance up to second position around the outside of John Dalerio. Three laps later, Moore dove inside Mansch into turn one to take the lead. Bolin pitted again under the green flag run as his damage worsened and he failed to return to the race. Cole Moore’s hopes for victory were dashed when he stopped in the infield on the backstretch for a lap 38 caution. Moore was able to re-fire and drive into the pits but it handed the lead back to Mansch once more. Cole Moore did not return to the race. Ukiah’s John Dalerio spun in turn four on the next restart but managed to continue. Dave Byrd spun into the infield, however, to force a caution. Romero knifed his way through the incidents into second place. He took the lead from Mansch coming back to green and never looked back. Romero built up a sizeable lead until Dalerio spun again in turn four. John Moore pitted under the caution to surrender a top-five run. Romero was undeterred, driving to a five second win while Mansch fended off champions Mike Beeler and John Moore for a well-deserved second place finish. Matt Scott came back for a fifth place finish while Anderson’s Ryan Peeples drove from 14th to sixth to win the Penney Racing Supply Hard Charger. The Pacific Challenge Series presented by PenneyLawyers.com resumes on May 19th at Ukiah Speedway for the *North State Challenge*.